Properties FormDrops Weight69 (gms) Dimensions3 (cm) x 3 (cm) x 9 (cm) Indications of Dr. Reckeweg R73 Osteo-arthritis especially of the large joints, arthritis of the knee and hipjoint, osteo-arthritis of the vertebrae. 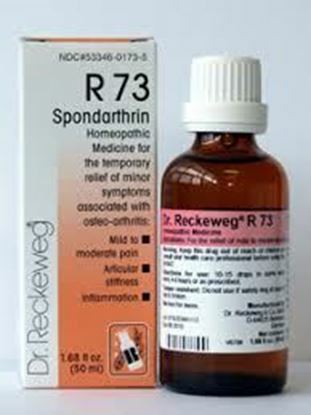 Mode of Action of Main Ingredients in Dr. Reckeweg R73 The ingredients contained in this preparation influence the metabolism of cartilage in particular. Long term medication is necessary before definite improvement sets in. This is best explained by the fact osteo-arthritis is a gradual degenerative process. Acidum sulfuricum: Arthralgia in different joints. Markedly influences the metabolism of cartilage. Argentum: Arthralgia associated with degeneration of joints. Arnica: Painful joints. Bryonia: Swollen, stiff joints, worse on movement. Causticum Hahnemanni: Joint deformity associated with paralytic weakness and stiffness. Ledum: Rheumatic joint pain, cramping pain in hip area. 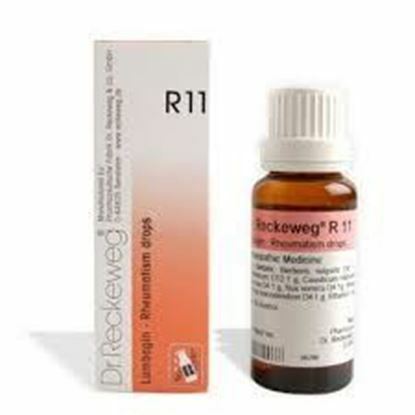 Also known as R 11 Properties FormDrops Weight69 (gms) Dimensions3 (cm) x 3 (cm) x 9 (cm) Indications of Dr. ReckewegR11 Acute and chronic myalgia, lumbago, rheumatic diathesis after effects of drenchings, sprains, overstraining. Back pains of unknown genesis. Growing pains in muscles and bones. Sciatica from getting wet, from sitting on cold seat and suppressed perspirations. Chronic articular rheumatism with deformations. Spondylarthritis, spondylosis, sacroiliac arthritis. Rheumatic aches (muscles, articulations, ligaments) growing worse with change of temperature (humidity).